Many people unfortunately will not understand why I suggest this. In my experience, the day I started studying for NCLEX was the day I discovered ever answer to every question I had got wrong on prior exams. In retrospect, If I had looked at the NCLEX information sooner. I would have performed much better on exams. It does not have to be a formal review. Try purchasing a review book online. Or browser my blog for free review materials. Good luck and study hard! Found your blog through twitter :-) I agree a nclex review course is a great resource to help pass NCLEX. I also recommend the Saunders Comprehensive review guide. I used it to prepare for my boards and passed the first try. Hello Sarah, You are right! I used Saunders when I was in school and it was so helpful. Thanks for informing our readers about that awesome resource! Thanks and stay tuned to this site for more great nursing tips! Thanks Kat! I will check out your site and learn more about what it has to offer. 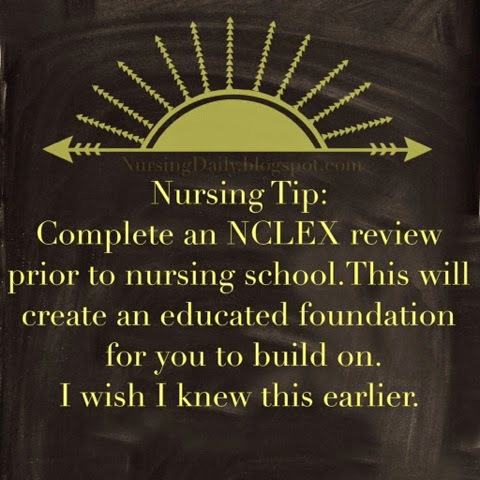 Thanks for sharing with us here on Nursing Daily! Sty tuned for more great Nursing tips!